You are going to Watch Naruto Shippuden Episode 70 English dubbed online free episodes with HQ / high quality. Stream Anime Naruto Shippuden Episode 70 English version Resonance.The chakra of the Nine-tails rages out of control within Sora, preventing Naruto and the others from subduing him. Asuma and Kazuma resume their old battle. Naruto is repeatedly knocked down in his attempts to restrain Sora, and the chakra seeps into him and transforms him as well. 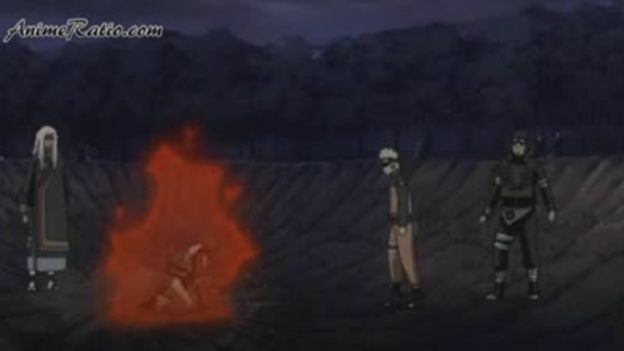 Yamato is unable to suppress the Nine-tails’ chakra in both Jinchūriki, being prevented by an unknown outside force. Sora’s fourth tail emerges, causing the Nine-tails’s Cloak to envelop his body. He temporarily gains his own consciousness when he witnesses Naruto stab himself in the leg and successfully prevent the original Nine-tails’ Cloak from emerging.